When most of our renovation zone house was safe enough and my daughter moved upstairs with us 3 weeks ago, we brought up her old potty chair and an underbed storage container that we've used for 2 years as her "within-bathtub-tub." In our 5 x 8 bathroom, these two items were functional clutter. I knew they were helpful for us, but I'd have to move them from place to place to access things we needed. We resolved these issues by purchasing two products and love the improved function they give us and the instant return to less clutter on our bathroom floor. We splurged a little and used our Home Depot consumer credit card to purchase a quiet close toilet seat that had a toddler sized potty seat attachment. Now, our daughter's potty is integrated with our potty, and as a bonus, the larger seats do not slam (although the toddler seat can). 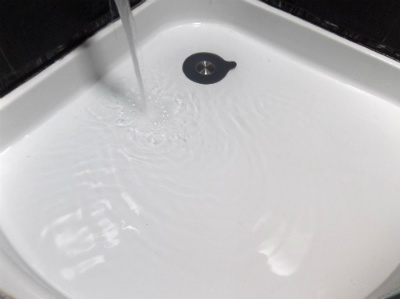 Also, the toilet seat can be easily unsnapped from the toilet, making our one piece toilet even easier to clean. And the best part is, since I used my HD card, I can pay for this seat over 6 months. Basically, for less than the price of a restaurant lunch every month ($10), we were able to solve our potty problem. Problem: Our daughter was outgrowing her underbed storage container "tub" and our bathroom had little space to store it. Most people choose a bathtub in the bathroom, especially if they have children, but bathtubs have only made me nervous when it comes to our daughter. The sides are too high for her to step over, tubs are made of hard, dangerous material, and they can easily fill up with too much water. All of these safety hazards were a concern, so when my husband spotted a corner shower, with a low shower pan and design we loved, we did not hesitate to pull out our old tub (repurposing it as a planter outside), and install a shower. "After" the tub stopper. Less clutter, more space. 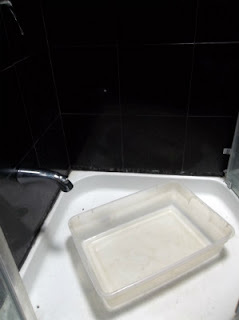 Our daughter certainly outgrew her little storage tub now that she is 3, and it struck us that the entire shower pan is liken to the perfect kiddy pool. It has low walls, but high enough to hold 2-3 inches of water. It is wide enough for our toddler to bathe and play in and there are doors to keep the splashing contained. All we needed was a tub stopper, and the OXO Good Grips one works so well for us for little extra money. All I do is cover the drain with the silicone stopper and fill the shower pan with water, close the shower door, and let my daughter swim in her pool. Who would have thought that with a stopper, a corner shower would be THE best toddler "tub" ever for us.